Coveo Enterprise Search (CES) installs RabbitMQ that is needed to operate with other Coveo products such as Coveo for Sitecore. The CES installation wizard offers and recommends to set the RabbitMQ administrator credentials (see Installing CES on the Master Server). 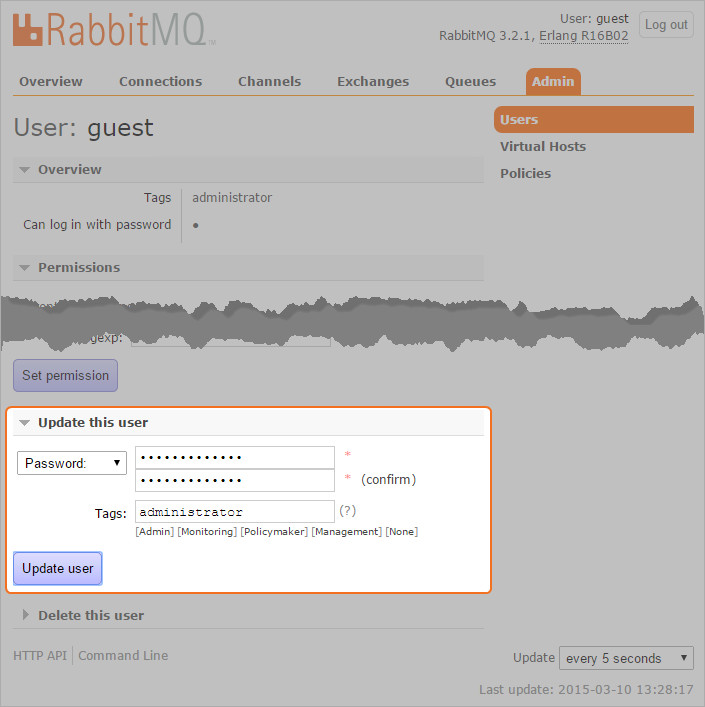 The following procedure describes how to change the RabbitMQ administrator password when RabbitMQ is already installed. Using an administrator account, connect to the server where CES is installed. Using a browser on the server, access the http://localhost:15672/ URL, and then enter the current administrator credentials. Note: The default administrator username and password are guest and guest. On the navigation toolbar at the top, click Admin. In the navigation panel on the right, click Users. Under Users, click the administrator user. Click Update this user to expand the section. Next to Password, enter the new password twice, and then click Update user. Take a note of these credentials in a safe place of your choice.